I hope our old and new friends in this artistic skating forum will use this thread to introduce themselves. Welcome everybody! - What is your interest in artistic skating? Are you a skater, former skater, potential skater, parent of a skater, competition judge, federation member, rink owner, skate manufacturer, member of the media, or just a big fan of the sport? - What country, state or province, and neightborhood are you from? - Where do you usually skate? - Do you only skate for fun or do compete? If you compete, what events have you participated in? If you don't compete, do you have any interest in doing so? - What skates, frames, and wheels do you skate on? - What else can you tell us about youself? What are your favorite hobbies and recreational activities outside of skating? PS: Please also consider introducing yourself to an even larger group of skaters by posting in one or more of the Main Forum Introduce Yourself Threads. Last edited by Kathie Fry; August 7th, 2007 at 04:08 PM. Last edited by NaNaDo; May 12th, 2008 at 05:44 PM. - As a solo skater I competed in Club Competitions, British Championships & Cup of Europe and as a couples skater I have skated in Club Competitions, Silver Cup Competition, British Championships, European Championships & World Championships. - I use Edea Flamenco boots, Roll-line Energy Plates & Roll-Line Grease/Formula wheels. Before quiting 17 years ago I skated Junior dance, junior mens single and figures. Test wise, under to old systems of the 70's I have my gold bar in dance, passed the 6 freestyle, 7 figures and 5th intl dance. I skate Masters Teams dance for a year and a half with a wonderful partner who also come from a very long skating history. We just got back from Nationals and placed 9th in dance out of 21 teams. We were very pleased with how we did. Our coaches are Ken Watts in St. Louis and John Peck and George Haver in Chicago. Married for 32 years, two sons, Steve and Bill. Steve is married and Bill is moving to Germany to teach English at the University in Marbach, north of Frankfurt for a year. My wife is Joyce, works alot of hours and travel with work. I'm self employed with a home office. Two dogs, Maxwell and Maggie May both Soft Coated Wheaton Terriers. When not working or skating I'm restoring a 1972 Corvette Stingray. Last edited by masterd; August 7th, 2007 at 08:14 PM. I am Dawn and I am currently planning a return to skating after being sidelined for a few seasons because of injury and illness. I skate (or I skated) in the Southeast region for Nickie and Barbara Nolte and live in Virginia. I skated novice A figures and classic A solo dance. My best nationals finish was 4th in novice A figures in 2001. Of course, they didn't award 4th place back then... I plan to go back to being coached by the Nolte's when I return. They also coach Chris Fairman, who is the silver medalist in WC men's figures at this year's nationals. I am on the 9th figure test, 3rd loop test and the 12th American team dance test. Not a lot of testing is done around here and the problem of finding a skilled partner to practice my test dances with has been recurring. I also have a problem with the back-to-forward turn on 20A, LOL. When I am not thinking about skating (I "skate" my Dench blues in my mind while going to sleep at night, LOL), I work as a bartender in a local sports bar and write commentary/interviews for three shows for a large online magazine that covers soap operas. I skate (or I skated) in the Southeast region for Nickie and Barbara Nolte and live in Virginia. Two of my favorite people in skating. If we only had more rink operators and coaches like them. Yes I'm lucky in the fact that the Nolte's are not only wonderful coaches but that they also own and operate their own rink. I am Sharon, and as it says, I am pastskater. So yes, I am a former a skater and a Mom. I have a young child that is coming up and it will be soon to see her with a set of skates on. My family was a skating family who started in Oregon with two rinks. One in Ashland,OR and the other in Medford, OR. There my Uncle and Mother and Grandparents made their days with skating. Later my Grandfather almost opened a rink here in CA, but that didn't happen. I skated at Redwood Roller Rink for which a return there is in the works. My friend and old coach still an asset at Redwood Roller Rink aka RRR (pity not MMM)! I have a pair of skates with custom Harlick's, synder plates, and oh boy the wheels I haven't a clue except the ones as push wheels are Valdeck. I haven't skated in 20 yrs. I won't skate on a competitive nature and if my child is in decision of continuing in skating then my skates get a scrub and I will try a roll or two. I am currently getting ready to continue school for a Science Degree. I am a lover of Opera,Ballet,Travel, and old music such as: Big Band, Broadway, Bing Crosby and many others that are far too old for me-so they say!. I am a cook by many styles and pass many of the recipes here on to Roger's thread:Recipe share board. I love good Artistic skating with good impression and precision and grace. I have been able to grow up with good skaters around me at a young age and it is easy to know great from good. I love this forum for being kept up-to- date with many of the World's greatest skaters and those to come. Thanks for being here Kathy and making this all possible! All the rest of you that have helped me in so many ways Thank you! Best of luck in your skating...Everyone! Too Old School For You. Q: What is your interest in artistic skating? Are you a skater, former skater, potential skater, parent of a skater, competition judge, federation member, rink owner, skate manufacturer, member of the media, or just a big fan of the sport? A: I'm a skater, but my family didn't start me, well kinda, I used to just skate session. My family skates competitivly.. on my mom's side.. but my dad's side did too (not anymore). My parents met at the rink. My dad was (who's now) my aunt's dance partner. She told him that her sister was coming home from college.. and the rest is history. I started when I was in the third grade.. but then quit 6 months later. (That's the one thing I most regret.) Started up again, last day of 6th grade.. now I'm entering sophmore year in HS. Q: What country, state or province, and neightborhood are you from? Q: Where do you usually skate? Q: Do you only skate for fun or do compete? If you compete, what events have you participated in? If you don't compete, do you have any interest in doing so? I compete. But I mostly skate for fun (sessions and stuff), I compete because I kinda have to.. they won't let me jump during session. Q: What skates, frames, and wheels do you skate on? Figures: Risport boots, Atlas plates, and Giotto wheels. Freestyle: Reidell boots, Snyder super delux plates, and Panther wheels. (My skates are old [freestyle about 20, figure about 15] but.. free!! When my other aunt Amy on my dad's side quit skating, she just happened to have the same size foot as me.. so she dug them out of storage and gave them to me.) No. 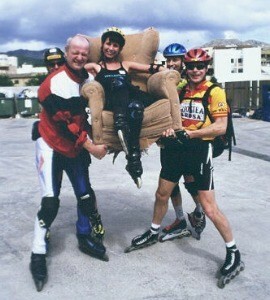 My freestyle skates are not heavy. Q: What else can you tell us about youself? What are your favorite hobbies and recreational activities outside of skating? I don't do much. I skate. Go to school. Go to church. Go to work. Eat. Sleep. That's about it. I also work in the rink too.. in the snackbar. I'm birthday party queen. Oh, and I'm a HUGE die-hard fan of back to the future. I am currently competing in a adult team event. I've been skating team dance in adult divisions - I want to start lessons in solo dance. My name is Julie, I skate for the Northern Dynamics Roller Precision Team. We are preparing to put together our team for the 2007/2008 season. I will let you know when practice starts, where and what time. ~i'm miriam (hehe, but my 'skating name' is agatha may! ), and i do intermediate freeskating. ~i currently compete, and last year was my first year at nationals i skated in preliminary in 2006 and 2007. ~i use edea overture boots, roll line variant plates (thinking of upgrading though, yay), and roll line fox wheels. ~ooh favourite hobbies... *thinks* i normally tell people about skating in this bit!! well besides skating, i go to uni and am studying to be a music teacher, i play flute and piano, and do a bit of leotard sewing. Since I've asked everybody else to do it, I guess I better introduce myself. My name is Kathie Fry, I live in Venice Beach California, and some of my favorite hobbies are skating, sea kayaking, playing classical guitar, reading, creating Web sites, and traveling all over the world. I'm definitely not a professional at any of those things... I only do them for fun. My "real" job is in the semiconductor industry and it has nothing whatsoever to do with skating or Web sites, and only a bit of traveling is required. The kind of skating I enjoy doing the most is skating up and down the beach listening to music. But that being said, I am the world's biggest fan of all types of inline skating and quad roller skating from x games style aggressive skating to artistic and everything in between. I own 17 pairs of skates (all types), and I love traveling to exotic countries, especially if I can skate there or watch a skating event. I've attended the world championships for aggressive, artistic, downhill, hockey, and speed skating and I've skated in quite a few countries myself over the last few years... Belgium, Cuba, Denmark, Finland, Italy, the Netherlands, Russia, Spain, Sweden, Switzerland, and probably a few more countries I cannot remember off the top of my head. Nice to meet you everybody! I'm rather new to the sport compared to some of you that are my age. I skated for the first time in my 30's and Found out about Artistic skating in my late 30's and have been skating club for the past 8 years. I skate for fun, and also compete in Esquire Figures. I compete because it gives me a goal to focus on, and I feel it's one of the best ways to support the sport. I also skate Dance and other figure events at local contests, and of course Gold Skate. I'd like to skate team, and I've been working on getting one of the skate moms to skate with me next year... hopefully things work out. I also like to skate sessions and try to visit all the rinks in my area. Skating Session is where I started skating, and I still enjoy it. I also enjoy skating outdoors. I skated several of the outdoor night skates in my area for many years. I like skating in new places so I take my inlines when I go on vacation for a week or more (also the only cure for skate withdraw). Like a few others on this forum I'm a big fan of all types of skating. I think the best skating to watch is when the skaters are having fun, and doing cool things on skates. You can't beat that. I also enjoy going to organized events including events like Skate Jams to World Class events , Art (2004), Roller Hockey (2005), Roller Derby (2005). Art Worlds was great and everyone should go if they can. I just saw D Miles "Burning Man" Rink post, on the other forum, and put that on my to do list. Besides skating I also enjoy Photography, Bicycling, Camping, Chess, and Live performances. I was also an active member a 2 times National Champion Middle weight Combat Robot team. OK, someone else now, let's keep this rolling!!!! ok bill what is a combat robot team?????? Think Battle Bots, That's what we designed it for. Ours weighed 120lbs and dominated the middle weight for 2-3 years including 2 national titles. It took a lot of work... and money. There wasn't much else to win, so it was retired. Since then the bot's been cannibalized and My buddy Mike (it's his bot), and my Nephew are using the speed controllers and batteries, adding some processors and solid state gyros, to make Segway clones. Mike's a skater, but also a techno gearhead. my nephew who was also on the team, is a future CEO/Inventor/VCmagnet and currently a highschool kid (who already has a patent) he just wanted something cool to ride to school. thinking this might be a bronwen?